Introduction: In 2012, a minimum data set (MDS) was proposed to enable the standardized collection of biomedical data across various mass gatherings. However, the existing 2012 MDS could be enhanced to allow for its uptake and usability in the international context. The 2012 MDS is arguably Australian-centric and not substantially informed by the literature. As such, an MDS with contributions from the literature and application in the international settings is required. Methods: This research used an integrative literature review design. Manuscripts were collected using keyword searches from databases and journal content pages from 2003 through 2013. Data were analyzed and categorized using the existing 2012 MDS as a framework. Results: In total, 19 manuscripts were identified that met the inclusion criteria. Variation in the patient presentation types was described in the literature from the mass-gathering papers reviewed. Patient presentation types identified in the literature review were compared to the 2012 MDS. As a result, 16 high-level patient presentation types were identified that were not included in the 2012 MDS. 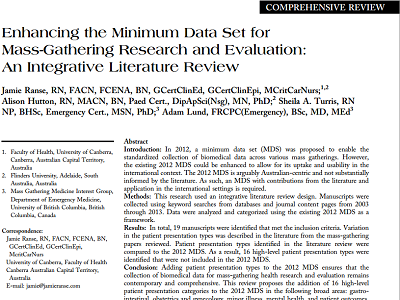 Conclusion: Adding patient presentation types to the 2012 MDS ensures that the collection of biomedical data for mass-gathering health research and evaluation remains contemporary and comprehensive. This review proposes the addition of 16 high-level patient presentation categories to the 2012 MDS in the following broad areas: gastrointestinal, obstetrics and gynecology, minor illness, mental health, and patient outcomes. Additionally, a section for self-treatment has been added, which was previously not included in the 2012 MDS, but was widely reported in the literature.